Filed under Easter, Holiday Flowers. Celebrate all things Easter with Calyx Flowers. 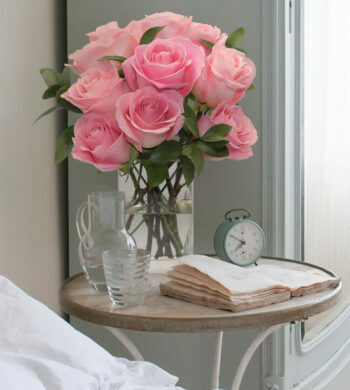 We’ve put together nine fabulous flowers you can send that capture the beauty of spring and will let your special recipient know you are thinking of them in the very best way. Peruse our picks and don’t wait another second to order! 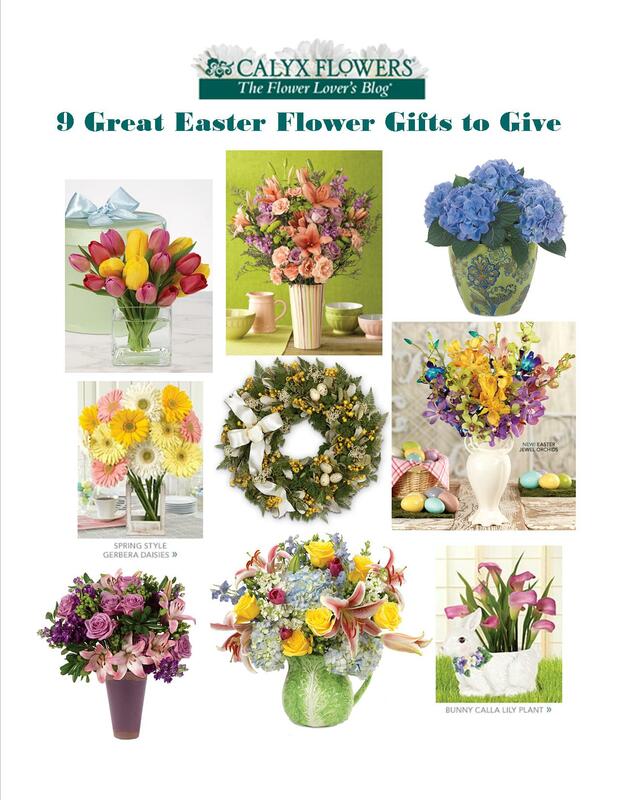 Make Easter extra special this year with our floral arrangements. 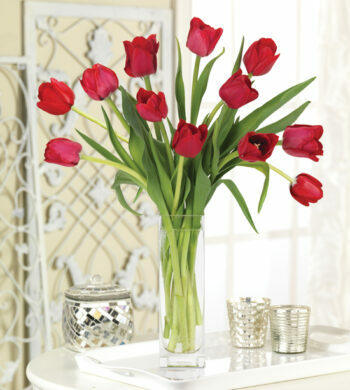 Springtime Tulips Hatbox Bouquet (shown top left) – Set the scene with the gorgeous gift of tulips in a rainbow of colors. What sets this gift apart from all the others? The bouquet arrives in our keepsake sating hatbox with bow. Candy Stripes Bouquet (shown top center) – Make Easter special with a marvelous mixture of pastel blooms that will coordinate just right with all your Easter eggs and candy. Blueberry Blue Hydrangea Plant (shown top right) – The spring season is that special time of the year when hydrangea once again come into bloom. Delight in the brilliant blue blossoms of this popular plant week after week. 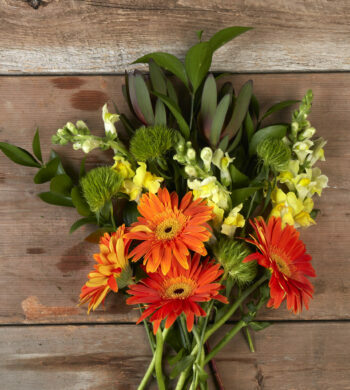 Spring Style Gerbera Daisies (shown center left) – The soft palette of pink, yellow, cream and white was designed to capture the graceful beauty of the Easter holiday and springtime season. Spring Garden Wreath (shown middle center) – Looks perfect anywhere in the home you might need to add a touch of spring beauty and color. Isn’t the tiny nest of eggs a well-suited touch? Easter Jewel Orchids (shown center right) – Inspired by a basket filled with colorful eggs the Easter Bunny has left behind, our orchids are not only vibrantly beautiful but they are long-lasting too. Lavender Love Bouquet (shown bottom left) – With all its distinct shades of purple our popular bouquet represents one of the quintessential colors of the Lenten season and Easter holiday. Grand Garden Bouquet (shown bottom center) – Meet the best bouquet that brings the beauty of an outdoor garden in! The mixed bouquet of fragrant flowers fills its uniquely designed cabbage pitcher to the brim. The pitcher makes a keepsake gift when the flowers have faded. 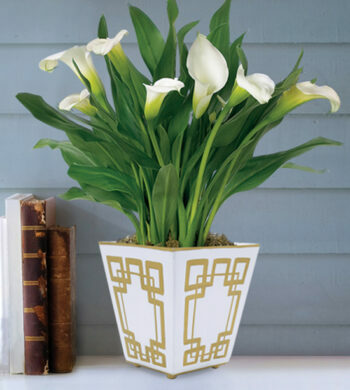 Bunny Calla Lily Plant (shown bottom right) – Our cute calla lily plant is an Easter essential. Available in limited quantities so hop to ordering it today!